To configure the global IPSec VPN parameters, follow the steps below. Step 2. 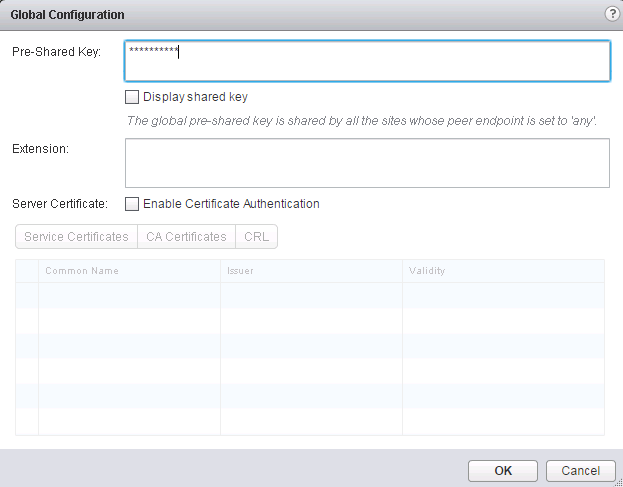 Enter values for the Pre-Shared Key, Extension and Select a Server Certificate (optional) then click OK. The pre shared key can be a string up to 128 bytes and will be used as authentication between the edge device and the peer site. Note: If you would like to configure a certificate, please see “Generate a Certificate Signing Request” section of the blueprint. FATCA IRS EIN Tax ID 0000931106 – SIC 8888 Europe Number:HCMC HRB 68648, Deutschland. at Bank E.D. GOUTOS S.A.
INCORPORATION STATE ΕΜΠΟΡΙΑ ΧΡΗΜΑΤΟΟΙΚΟΝΟΜΙΚΩΝ ΥΠΗΡΕΣΙΩΝ BIC EFGBGRAA IBAN GR1902603330000390200012234 Eingang auf Server: … FATCA Greece ( Greece Deals, E.D.GOUTOS Sa (AIFMs)) CITIGROUP 1989 .